PHENOmenon will develop and validate an integral manufacturing approach (material, process and technology) for large area direct laser writing of 2&3D optical structures, targeting high speed production of optical surfaces with subwavelength resolution, using NonLinear Absorption. 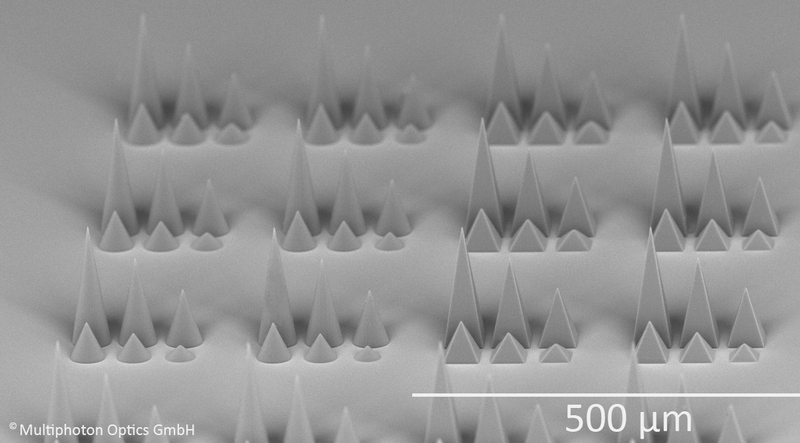 Developments in photochemistry and laser beam forming will allow producing structures at different scales (100 nm to 10 microns). An unedited productivity in freeform fabrication of 3D structures will trigger the manufacturing of new and powerful optostructures with applications in lighting, displays, sensing, etc. The novelty focuses on the combination of ultrasensitive nonlinear photocurable materials, and the laser projection of up to 1 million simultaneous laser spots. The photochemistry relies on new types of ultrasensitive photoinitiators and groundbreaking nonlinear sensitized resins for CW [Continuous Wave] laser writing. The developments in beam forming are based in modulation with SLMs [Spatial Light Modulators] and hybrid diffractive optics for massive 3D parallelization by imaging and holographic projection. The enabled optical structures (hybrid microlenses, waveguides, polarizers, metasurfaces and holograms) will be modelled at the micro and macroscale, to develop application oriented simulation and design methodologies. Selected demonstrators will show the capability to produce 3D optical micro-nanostructured components with unique optical characteristics, offering differential advantages in many products: advanced security holograms, efficient lighting, high performance optics, backlighting units for displays, holographic HMIs [Human Machine Interface] and planar concentrator microlenses. These components will contribute to address societal challenges like energy efficiency or security while reinforcing EU industry competitiveness. A consortium comprising 4 top Research Institutions and 8 Industrial partners (4 SMEs) covering the complete value chain, will develop this project clearly driven by user needs.